Home » Reviews » Eye cream: When, how and why? Eye cream: When, how and why? The skin in this area is the most delicate face and needs extra care. Leticia Carrera, director of beauty treatments and Olay consultant, explains how boast look and health coach, Beatriz Larrea, how to care inside. The facial skin is particularly sensitive, besides being the most exposed to external factors that damage our skin. And in particular, the area around the eyes is to turn the most sensitive and the first area where signs of aging are emerging. Do the dark circles, expression lines and swelling (“bags”) can be treated with the same product? They can be treated with the same cosmetic, while being aware of its limitations because sometimes the bags, for example, have only surgical solution. To what age should we start treating this area? It is convenient to start from the 25 years. When to apply: in the morning with the day cream or before bedtime? It is best to apply the eye area, both morning and evening, to increase their effectiveness. What part exactly should apply the product? From the lower lid of the center to the side, to avoid the area of ​​the tear to be more susceptible to in tolerances. On the upper eyelid just below the eyebrow but not in the eyelid. And especially on the side where the lines known as “crow’s feet” appear. What is the best way to remove makeup eyes? Without rubbing too much, slipping cotton until no makeup and using only specific products for the eye area. Is there any food to help care for the contour and avoid the bags? It is important to incorporate diet draining foods (asparagus, cucumber, pineapple …) and to prevent fluid retention that is what can cause swelling in the outline. To begin to care this delicate area, we suggest these 3 treatments. Spiral concealer Regenerist Olay Luminous: Their pigments “pearl effect” increase the brightness. And the gel and moisturizing cream texture and evens skin tone smoothing fine eyes. 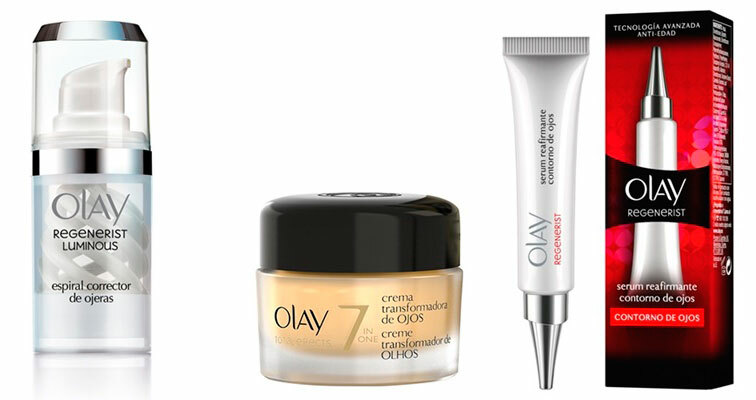 Eye Transforming Cream Olay Total Effects: 7 combat signs of aging in this area and dull skin transforms into a luminous, soft, moisturized and radiant skin. Eye Serum Olay Regenerist: To reaffirm and diminish wrinkles and signs of aging. Illuminates the area of the bottom of the eye thanks to its amino – peptide complex.